I found some cute little chocolate rocks and decided to package them up with bag toppers to share them with friends. I used DCWV Rockstar papers for the toppers. The U is cut from grungeboard and sponged with inks to match the papers. The ROCK on the purple package is stamped from the Hero Arts Monogram Alphabet set using Palette hybrid black ink. The ROCK on the other package is actually part of the designer paper. I thought I would try my hand at stamping on a transparency. I used my Lettuce Adirondack Acrylic Paint Dabber to ink my stamp and stamped it on the transparency. Once it had dried I edged the butterfly panel with my pinking shears and sewed it to a piece of kraft cardstock. The Happy Anniversary stamp is part of a Studio G $1 set. The butterfly is from the Happiness set from Artistic Outpost. The patterned paper is made using my scorpal and the technique I showed in this post. The hardest part of the card was trying to get a photo of it with the transparency on there. Happy Friday! I hope you have a great weekend. Thanks for stopping. Just a simple baby card using the How Sweet it is! set from Gina K Designs. I used SU Very Vanilla for the card base and the image. I added a zigzag stitch to the patterned piece for some added detail and colored the image with my copics. I hope you're having a great week! Thanks for stopping by. I love this sentiment and wine glass from Rubbernecker. Flying wine often happens at our monthly bookclub meetings. In fact some of us refer to it as wineclub since we do more drinking than reading! I've been trying to use up some paper scraps so I don't know what company the patterned papers are from. The wine glass is cut out and mounted on pop dots with a black ribbon tied around the stem over to the side of the card. I just cut a small slit in the card next to the stem to thread it through so I could tie it. I also added a few dew drops for some dimension. I'm sorry that my blog has been so neglected lately. The days are passing way too quickly this summer. Here's a cowboy card I made at a friend's request for a little boys 1st birthday. I love the Billy set from Pink Cat Studio and thought it would be perfect. I stamped Billy in Palette Hybrid black and colored him with Copics. The chipboard star is inked with chalk ink and the 1 is cutout with my cuttlebug (Olivia alphabet, I think) from a recycled cereal box and a layer of red cardstock. Thanks so much for stopping by. I will try and post on a more regular basis so I hope you'll stop again! I was making some squash books (see here for directions) the other day and looking at the coasters I was using and decided they would be great for little picture frames so here's what I came up with. 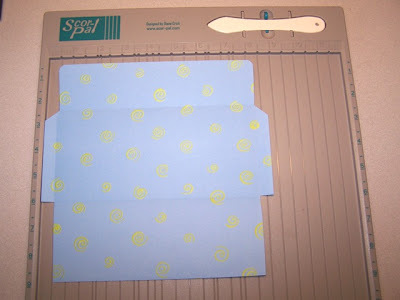 I cut a piece of 4x4 patterned paper and rounded the corners with my corner rounder. Next I cut a transparency into a 3 1/4 inch square and sewed it onto the patterned paper with my Janome Sew Mini. After attaching the paper to the front I also covered the back with matching paper and a large piece of magnet. To finish the frames I added a variety of stamped images, ribbons, and flowers. All of the stamps used are from Inque Boutique. The "dance" is cut out with my cuttlebug and covered in stickles so it sparkles. Wallet sized photos fit perfectly in these frames. Thanks so much for stopping by. I hope you like the frame idea. Let me know if you try them. Sorry for the delay in posting the envelope directions. 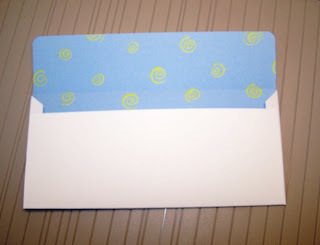 If you're making the money holder cards, maybe you're already figured out the envelope but here they are just in case. I started with a 8 1/2 x 8 3/4 inch piece of paper. 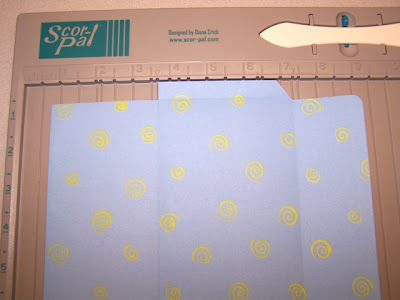 With the 8 3/4 inch side against the top of my scor-pal, I scored 1/2 inch in on either end of the paper. Next I rotated the paper so the 8 1/2 inch side was against the top of the scor-pal. Now slide the paper out to the 3/4 inch mark and score at both of the arrows that are marked (3 11/16 and 7 6/16). For the next step I cut the 1/2 inch pieces off of either end leaving just the middle sections. I also used my corner rounder on the corners of the smaller flap. Last step is to fold in the 1/2 inch tabs on the sides and fold up the 3 inch side and attach it to the 1/2 inch tabs to form your envelope. I decided to use some old 12x12 papers that I've had for years and keep the white on the outside and put the patterned side to the inside of the envelope. I really like the way it looks when it's put together and reveals the little bit of pattern when you open the flap. Let me know if you make some of your own money holders and envelopes. Send me a link! I hope you're having a wonderful week and are able to take some time for yourself!